After graduating, Nick and Freya sold their few possessions, and immigrated to South Africa to start an exciting new life together. They settled in St. Lucia Estuary and spend the larger part of their first year there doing community upliftment in a nearby local Zulu village. They really lost their heart to the incredible combination of bush, beach and people in this area. This 'Elephant Coast', as the region is called, was a must see for every visitor to South Africa they realized. They felt that most tourists in South Africa actually only did mere sightseeing, trying to see too many places in too little time. And to only spend two days in the Elephant Coast was a shame. For Nick and Freya it was a logical step to create a travel product that would take most of the traveling on highways away, and focus on experiencing destinations instead. The Elephant Coast is perfectly suited to that, as it offers great nature reserves teeming with the Big-5 and other wildlife, as well as sub-tropical beaches and an interesting culture of the Zulu and Thonga people. Nick was already qualified as nature guide, and whilst he started Tailor Made Safaris, Freya completed her guiding qualifications as well. In the beginning, they only offered privately guided tours to clients, but as the company grew they realised that they couldn't possibly guide all these clients themselves. The need to find and train other specialist safari guides was born. Moreover, for many people, a privately guided tour was prohibitively expensive. Freya came up with the excellent idea of offering self-drive tours as well, and then to equip those people with our extensive self-drive pack so they could travel with peace of mind. And here we are now. Tailor Made Safaris has grown to a well-known and reputable travel agency and tour operator, servicing hundreds of clients each year, and we're still growing. Our clients seem to love how we do things, consistently giving us excellent reviews and ratings. Our product range has expanded to include the best destinations Southern Africa has to offer. So has our team, we are so lucky to have found such loyal, pleasant and competent staff! Every day again there is such a good vibe at our head office in St. Lucia, what a blessing. In 2010 Nick and Freya got married on the beach, and in 2016 their lovely baby girl Ariel was born. This has necessitated that they leave the guiding for the longer tours to their specialist safari guides, and they have focused their attention more to a family life, and work 'close to home'. Apart from managing the Tailor Made Safaris team and furthering the company, Nick is still active as a guide but more for day trips or the occasional specialist tour. Freya is running our local horse safaris taking people out for rides on the beach or through the savanna. 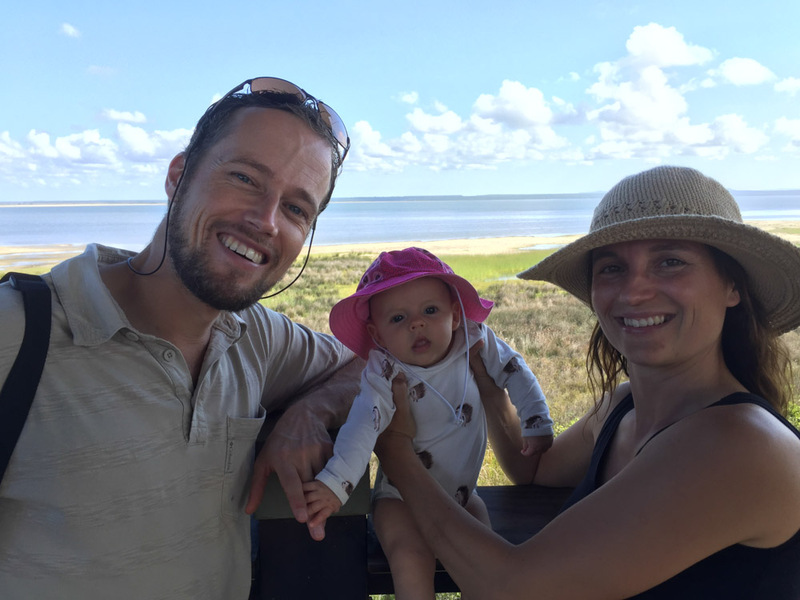 Nick, Freya and baby Ariel doing what they love best: Going on safari in the iSimangaliso Wetland Park!